We’ve been hard at work over the last three months giving birth to a new project! I actually ended up sort of accidentally writing a whole new book to go with this kit. It was originally going to be a collection of handouts as a pdf. However, as I put the handouts together, I realized I was actually writing a short book or manual instead. I also reflected on how I am tired of only getting pdf manuals and ebooks when I sign up for different programs, rather than an actual, printed book. One of my mottoes this year is to follow the inspiration, so I went with it, and at the end of last month our new books arrived and they’re beautiful and I’m so excited about them! Womanrunes Book and Card set: ideal for personal guidance and self-development, or for the inspiration and renewal corner at your Red Tent Circle. 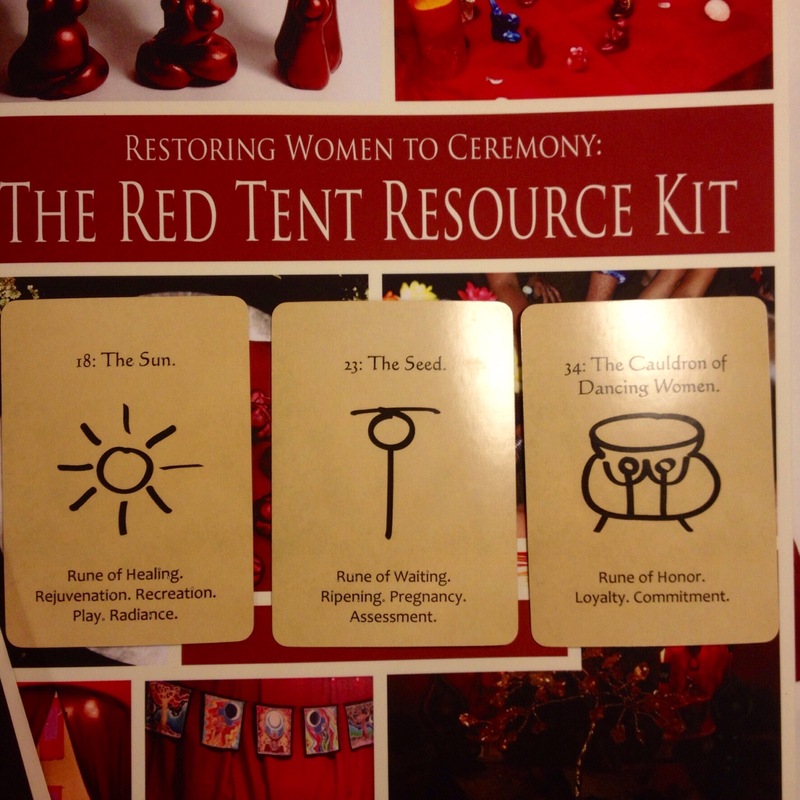 Brand new 58 page book: Restoring Women to Ceremony, The Red Tent Resource Kit, written exclusively for this kit. In this collection of essays and ritual resources, you will find a complete Red Tent “recipe,” circle leadership basics, moontime musings, and readings, quotes, and poems to help you facilitate a rich, inviting, welcoming, creative space for the women of your community. Extra surprise bonus goodies intuitively chosen for you! The contents of this Kit are valued at $100 when sold separately! Yesterday we had a celebration day for Brigid’s Day (our biz-aversary) and Tanner’s three-month birthday ceremony in which we touched his little feet to the Earth for the first time. 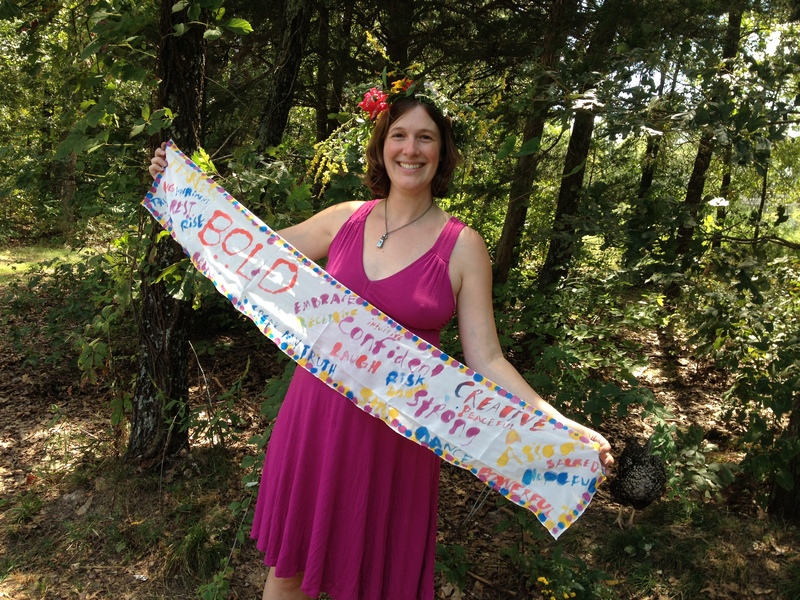 We wrapped him in his silk painted “welcome” banner that we made this summer as part of my Sacred Pregnancy class and took him down to my special place in the woods (the very place that told me I was pregnant with him in the first place!). 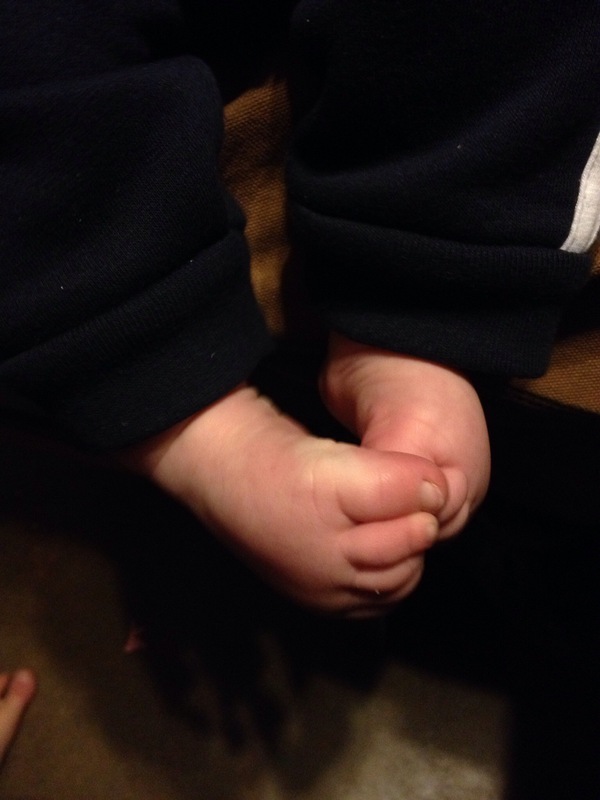 It was chilly and his poor little feet turned a little bluish-red during the feet touching! We touched his feet to rock, leaf-covered earth, and tree and I offered him a blessing of welcome and love. 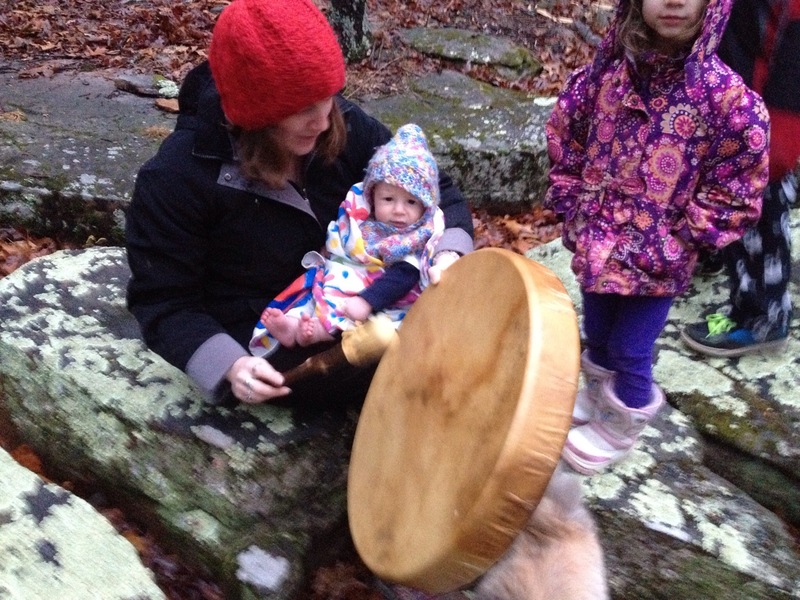 And, we sang two songs and drummed a little before fleeing through the sleety air back to the warmth of the house! I planned to do our feet-touching ceremony on January 30th, but by the time we got home that day it was dark. I thought about dragging everyone out to do it anyway, but instead just gifted us all with waiting until Sunday for our little celebration. 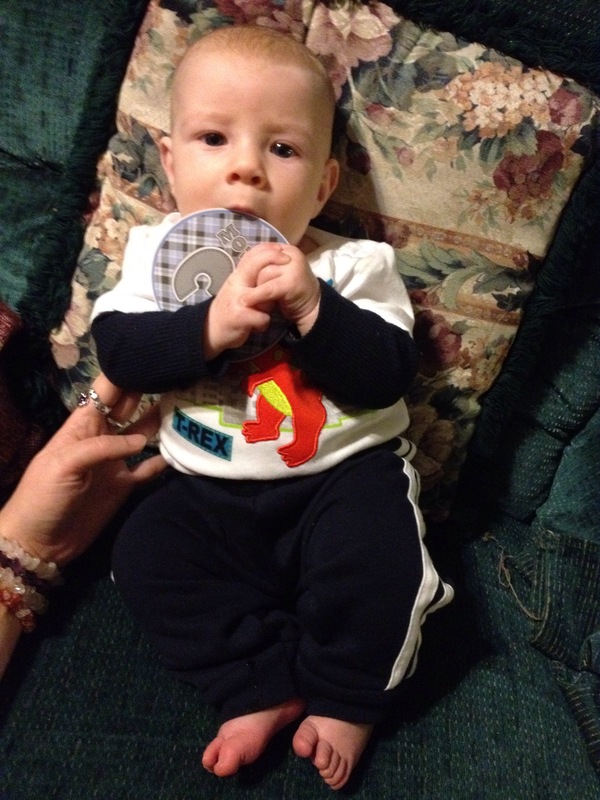 I posted the following day that Tanner’s new three-month nickname might have to be No Nap Tanner. Whew. He has a tendency to get extremely stressed out in the car and it seems to then lead to feeling insecure the following day involving only sleeping in twenty-minute scraps and being fretful. As I’ve written before, happiness as a mother is in direct proportion to length of nap taken by baby and we had a really negative, cranky Saturday overall. Lucky, Sunday was lovely and repaired all our nerves. I also wanted to share that I finished the final two assignments in my final class at OSC yesterday. I am now ABD (all but dissertation). I can hardly believe it! I’ve been working on this degree for a long time and I actually expected it to take me several more months from now to finish my final classes. Finishing my dissertation project is one of my biggest goals for the year (I have several others too). 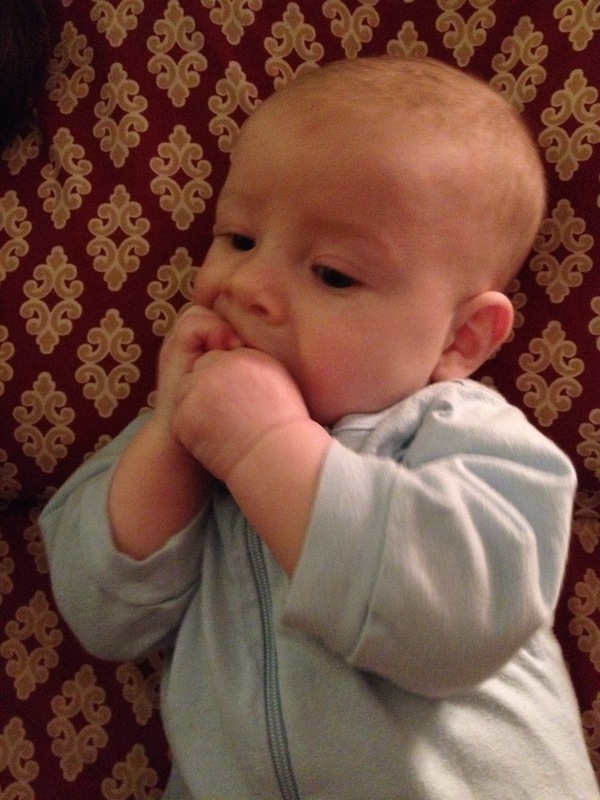 Today, I was reminded in multiple ways that I did just have a baby three months ago. It is okay to pace myself and to take my time. So close though! So close. “Fire and ice” trifle for Brigid’s Day. I am inordinately proud of these and we’re having another one tonight with the leftover supplies! At the end of September, my friend sat on the floor during my mother blessing ceremony and wrote the above poem for me. When she gave it to me she said, “I’m not like you, I don’t write things and share them on the internet.” It was very powerful to receive the gift of written word from someone who does not often write, but who knows how deeply writing speaks to me. 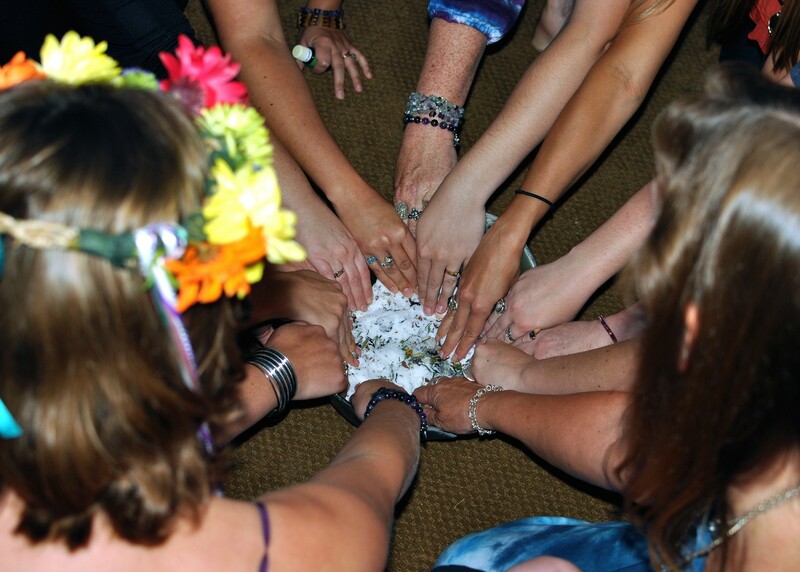 My mother’s circle of friends began holding mother blessing ceremonies for each other in the early 1980’s. At the time they called them “blessingways” in honor and respect for the Navajo traditions that inspired them to begin their own tradition. As awareness of cultural appropriation increased, we shifted our language to use “mother blessing ceremony” instead, though I confess that “blessingway” remains the term rooted in my heart for these powerful, mother-honoring celebrations of the power of the life-giving woman. After having been blessed with a ceremony during her last two pregnancies in the late 1980’s and having co-hosted coming-of-age blessing ceremonies for me and my sisters in the 90’s, my mother reintroduced the mother blessing ceremony to my own circle of friends during my first pregnancy in 2003. We’ve been holding them for women in the area ever since. I believe each pregnant woman deserves a powerful ritual acknowledging her transition through pregnancy and birth and into motherhood, regardless of how many children she has. Relating–the shaping, expressing, and maintaining of important relationships…established relationships were reaffirmed and new relationship possibilities opened. Many women choose to invite those from their inner circle to their mother blessings. This means of deeply engaging with and connecting with those closest to you, reaffirms and strengthens important relationships. In my own life, I’ve always chosen to invite more women than just those in my “inner circle” and in so doing have found that it is true that new relationship possibilities emerge from the reaching out and inclusion of those who were originally less close, but who after the connection of shared ritual, then became closer friends. Changing–the making and marking of transitions for self and others. Birth and the entry into motherhood—an intense and permanent life change—is one of life’s most significant transitions in many women’s lives. A blessingway marks the significance of this huge change. Healing–recovery from loss, special tributes, recovering from fears or scars from previous births or cultural socialization about birth. 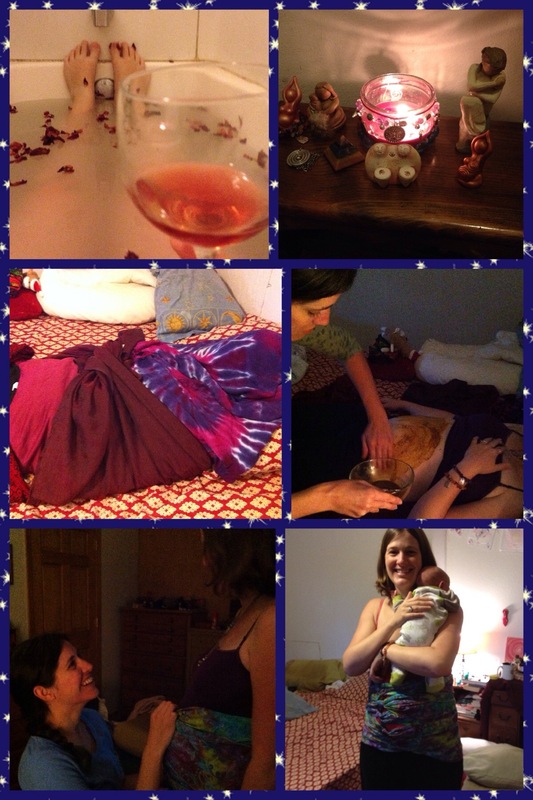 My mom and some close friends had a meaningful ceremony for me following the death-birth of my third baby. I’ve also planned several mother blessing ceremonies for friends in which releasing fears was a potent element of the ritual. Believing–the voicing of beliefs and the making of meaning. By honoring a pregnant woman through ceremony, we are affirming that pregnancy, birth, and motherhood are valuable and meaningful rites of passage deserving of celebration and acknowledgement. Celebrating–the expressing of deep joy and the honoring of life with festivity. Celebrating accomplishments of…one’s very being. Notice that what is NOT included on this list is any mention of a specific religion, deity, or “should do” list of what color of candle to include! I’ve observed that many people are starved for ritual, but they may also be deeply scarred from rituals of their pasts. As an example from the planning of a past ceremony, we were talking about one of the songs that we customarily sing–Call Down Blessing–because we weren’t sure if we should include it in case it would feel too “spiritual” or metaphysical for the atheist-identified honoree (i.e. blessings from where?!). I also remembered another friend asking during a body blessing ritual we did at a women’s retreat, “but WHO’s doing the blessing?” As someone who does not personally come a religious framework in which blessings are bestowed from outside sources–i.e. a priest/priestess or an Abrahamic God–the answer, to me, feels simple, well, WE are. We’re blessing each other. When we “call down a blessing” we’re invoking the connection of the women around us, the women of all past times and places, and of the beautiful world that surrounds us. We might each personally add something more to that calling down, but at the root, to me, it is an affirmation of connection to the rhythms and cycles of relationship, time, and place. Blessings come from within and around us all the time, nothing supernatural required. 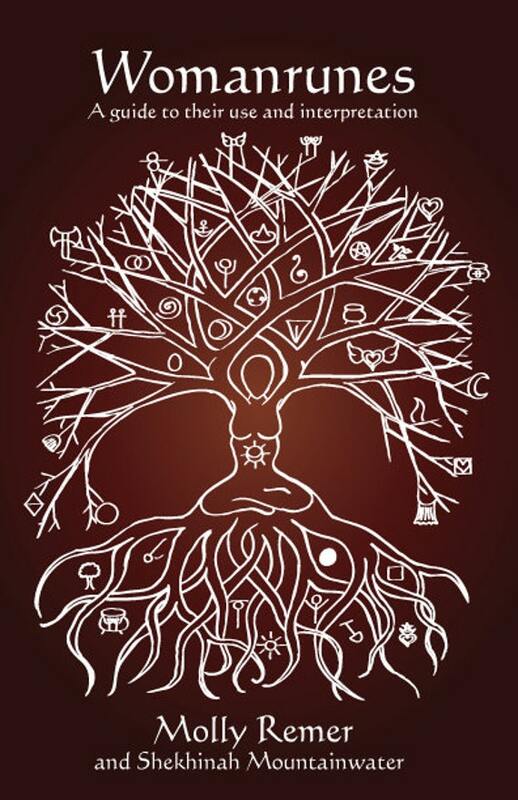 I also find that it is very possible to plan and facilitate women’s rituals that speak to the “womanspirit” in all of us and do not require a specifically shared spiritual framework or belief system in order to gain something special from the connection with other women. The entire Blessingway Ceremony is a template for childbirth. The beginning rituals are like nesting and early labor. The grooming and washing like active labor. The gift giving like giving birth and the closing songs/prayers, delivery of the placenta and postpartum. 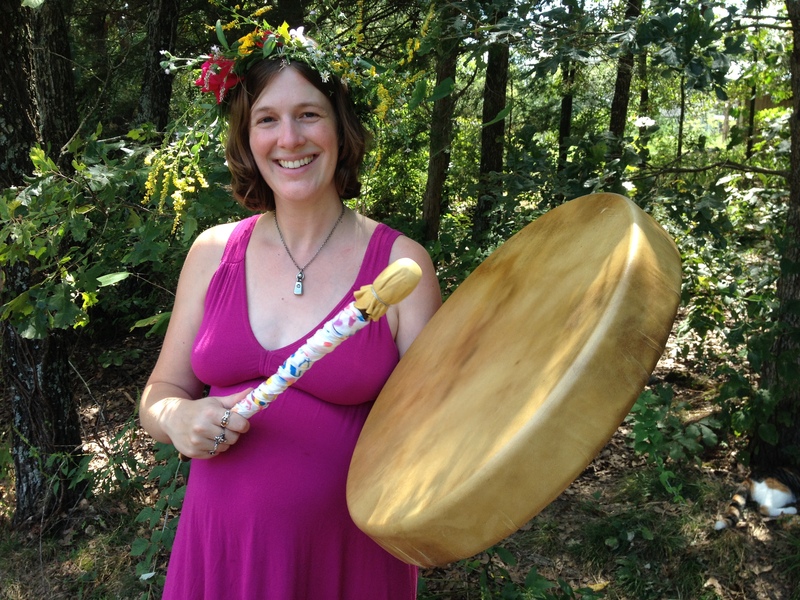 A shamanic midwife learns how to read a Blessingway diagnostically and mythically, sharing what she saw with the pregnant woman in order to clear the road better for birth. 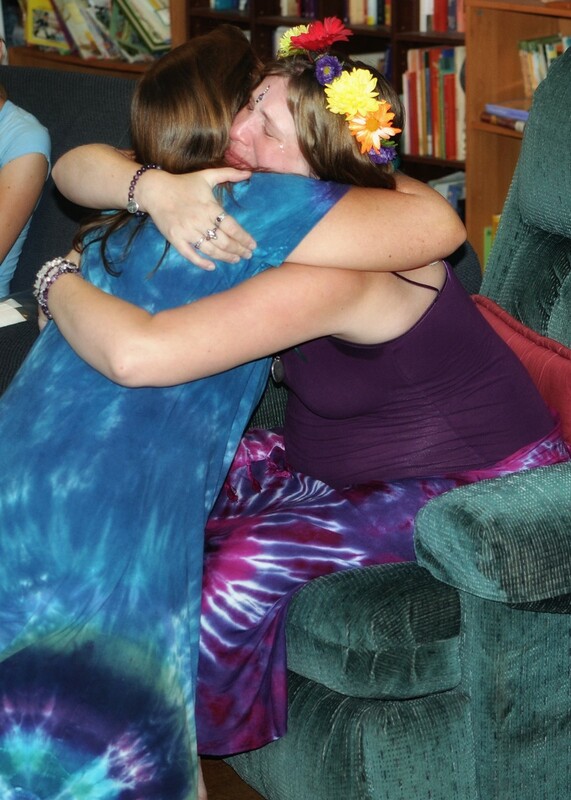 As my friends spoke to me at my own mother blessing ceremony, I felt seen and heard. They spoke to me of my own capacities, my strengths as a leader, teacher, and organizer. And, while I believe they were also actually trying to remind me of the opposite message, to take it easy and relax sometimes, one of the things I woke up the next day realizing is that yes, I do feel overwhelmed and overbooked and stretched thin at times. And, yes, I do whine and complain about it on Facebook sometimes, but in the end, I am always enough for whatever it is. I get it done anyway. I don’t think I’ve ever felt overwhelmed and then not done it (assuming “it” wasn’t a self-imposed expectation that I mercifully realized could be let go of). That is one my strengths: feeling the fear or the strain or the pressure or, yes, the excitement and thrill, and NOT getting paralyzed by it or letting myself off the hook. I work my way through and come out the other side, usually with my smile intact, my energy full, my head bubbling with ideas, and my eyes casting around for the next project. Occasionally, I do drop a ball, but pretty rarely, and when I do, I either find it or explain where it went and why I’m going to let it keep rolling away. I discovered in this post-ritual reflection that it is just part of my personal process to be able to say, and be vulnerable enough to have people hear, see, or read, that I think maybe I can’t do something or that I’ve said yes to too much. The answer for me is not, “then don’t” or “stop” or “quit” or “take it easy,” it is to move forward and to see, again, that I was actually enough for what scared me or felt too big or too exhausting. I woke up the morning following the ritual in appreciation of my own capacities and how they continue to expand, even when I feel as if I’ve reached my own edges. I actually feel “too much,” “too intense,” “too big,” or “too fast” for people a lot, but what I don’t ever need is to be told to make myself smaller. I usually need to be able to say, “Yikes! What am I thinking? !” have that held for me for a minute, and then do it anyway. Just as those of us deeply invested in birthwork would never tell a laboring woman, “you’re right. You probably can’t do this. You should probably quit now,” my mother blessing ceremony reminded me that I am stretched thin precisely because I have it in me. 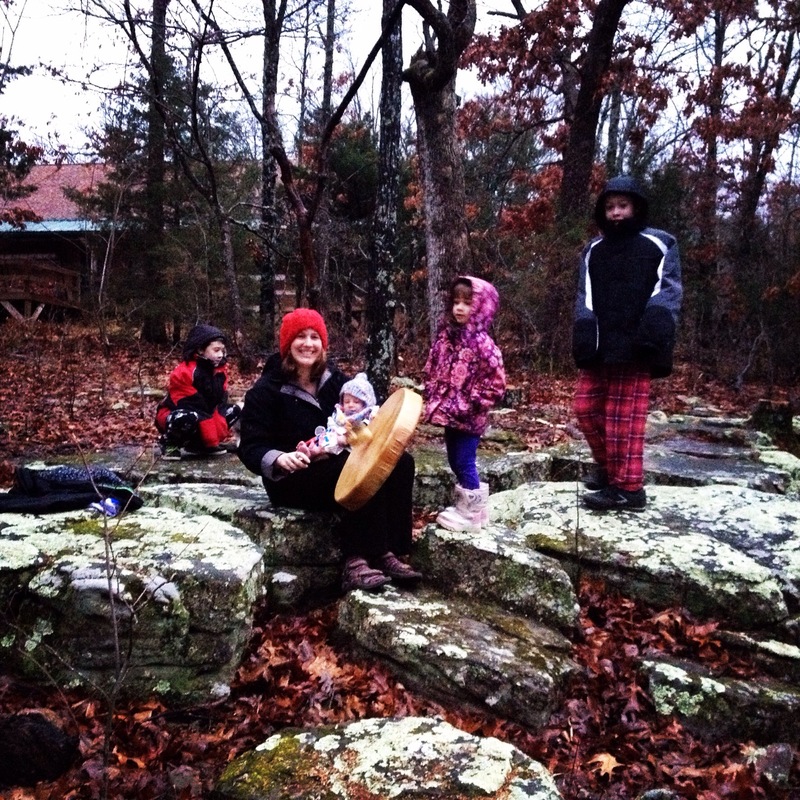 Molly is a priestess, writer, teacher, artist, and activist who lives with her husband and children in central Missouri. She is a doctoral student in women’s spirituality at Ocean Seminary College and the author of Womanrunes: A guide to their use and interpretation. Molly and her husband co-create at Brigid’s Grove: http://brigidsgrove.etsy.com. Portions of this post are excerpted from our Ritual Recipe Kit booklet. Adapted from a post at Feminism and Religion. Other posts about mother blessings can be found here. All photos by my talented friend Karen Orozco of Portraits and Paws Photography. 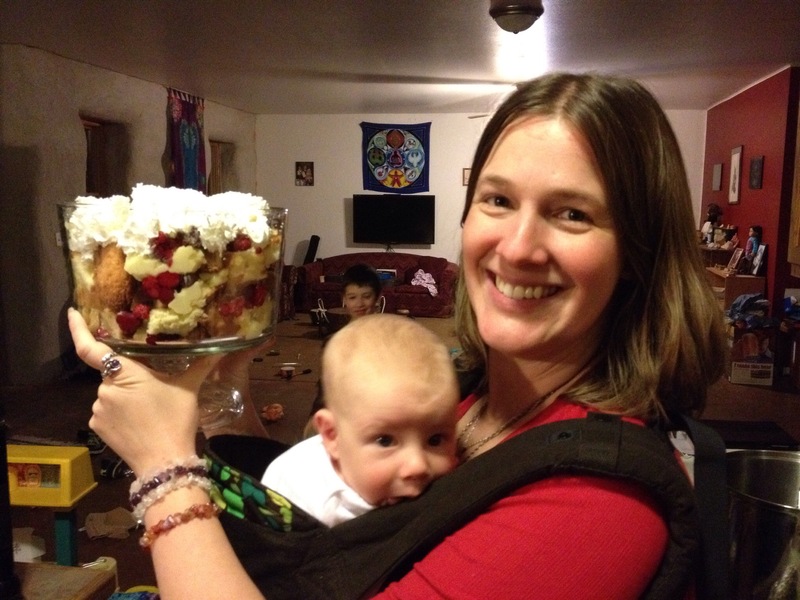 My Sacred Postpartum class began last week, though this is my first post about it. One of the assignments this week was to prepare a ceremonial bath. Despite the deceptively simple sound of the assignment, this bath was an incredibly surprising and illuminating experience. 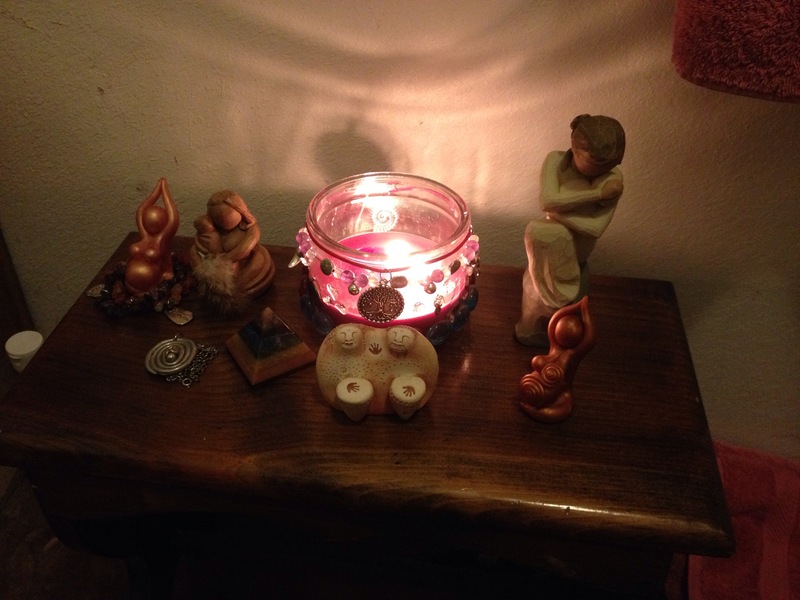 I originally put off doing it because I had “too much to do” and then when I started getting it ready and setting up a little altar and doing the smudging, I felt both nervous and kind of apprehensive. I told my husband, “I think this is the first real bath I’ve ever really taken.” I’m not really a bath person. I took baths as a little kid and then moved on to showers and never took baths again except while postpartum with each of my kids. And, that is when I had my “breakthrough” moment. My eyes were prickling with tears and I said: “I associate taking baths with being weak and wounded.” I associate baths with cleaning blood away from myself and gingerly poking around for tears in my most vulnerable tissues. I associate baths with crying and holding my empty belly after the death-birth of my third baby in my second trimester. In fact, the last bath I remember ever taking in my current home was the one following his birth in which I sobbed my sorrow into the water and bled away the last traces of my baby’s life. (I think I probably did take a postpartum bath after the birth of my rainbow daughter the following year, but I don’t have a memory of it. The only bath I remember ever taking in this house was my post-loss, grief bath.) I associate baths with strings of blood and mucous floating away from me through the water and feeling injured, hurt, damaged and invalid. Deconstructed, taken apart. Lost. Shaking. Barely being able to lift my legs to get myself back out. Having to call for help and be dried off. Hollow. Changed forever. 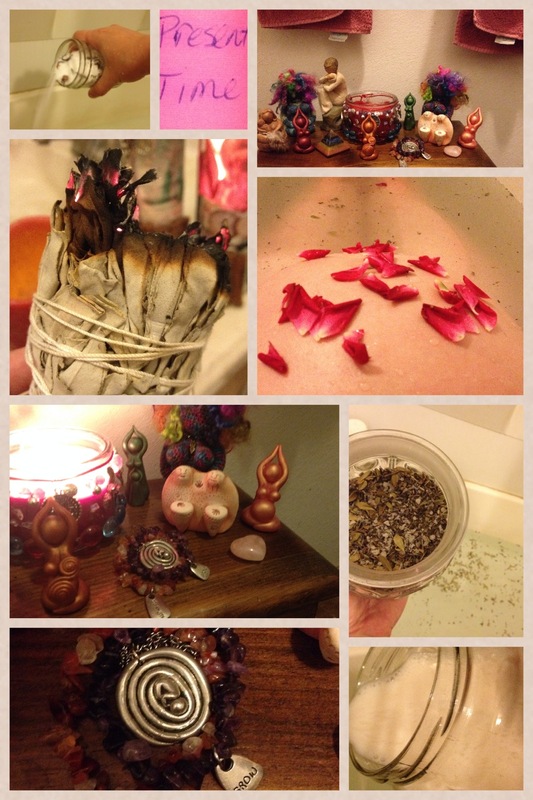 For this bath, I set up an altar space, turned on my Sacred Pregnancy playlist, smudged the room and the tub. My husband brought me my mother’s tea (a blend I made last week with friends using the recipe intended for later in this class). I added salts from the salt bowl ceremony at my Mother Blessing. I added a little bit of my sitz bath mix. I added almond milk and honey. 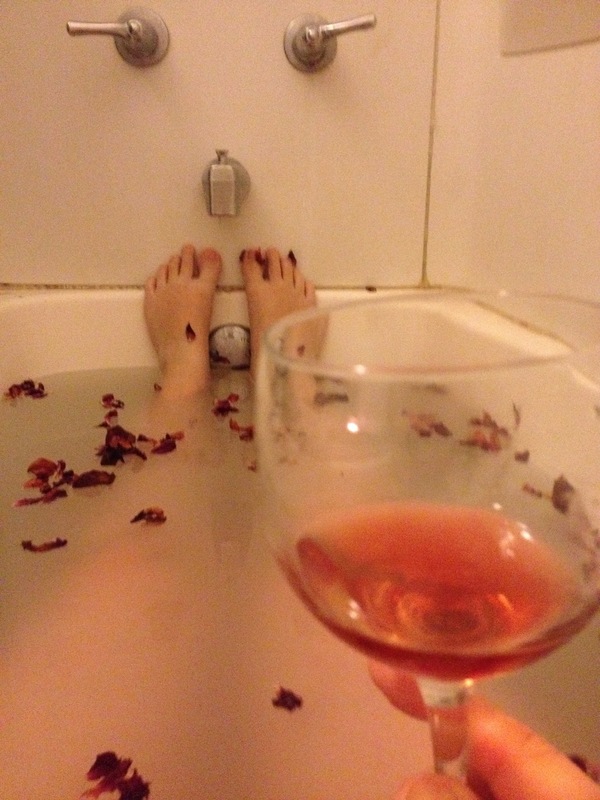 My husband went and picked a rose and scattered the petals in on top of me after I was in the tub. As I settled into my milk and honey bath, I felt restless at first, but then I calmed and my mind became more still. I went through my previous bath memories and I cried a little bit. I completely relaxed and sank lower into the water. I touched my body gently and honored what she has given and where she has been wounded. 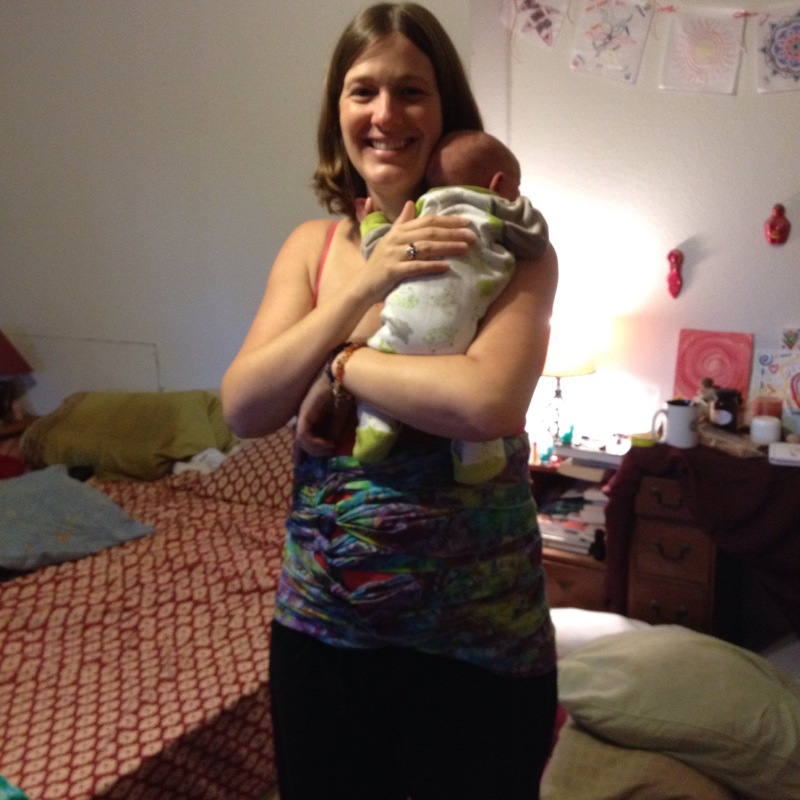 I rubbed my wiggling belly and talked to my baby about having a gentle, easy, smooth birth with a gradual emergence. 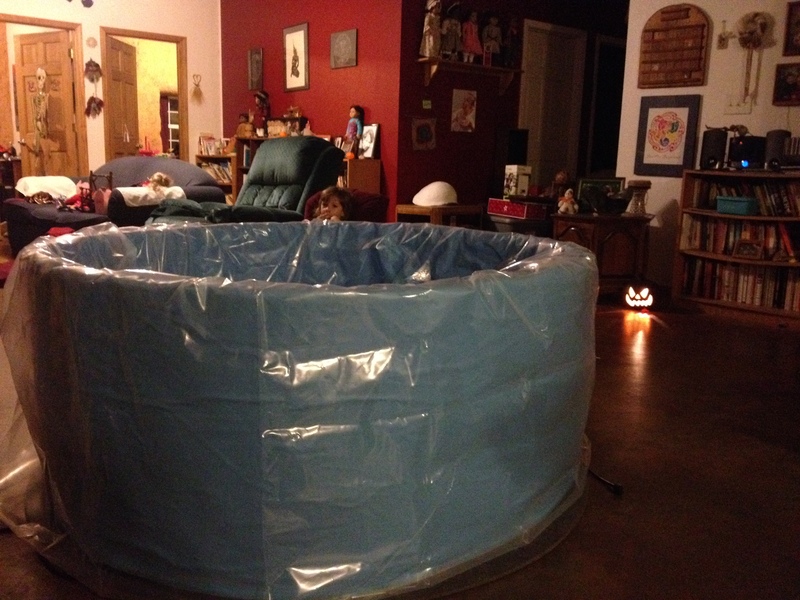 My thoughts turned to my possible plans for water birth for this baby. I realized that my own “weak and wounded” bath memories are probably, in part, related to why I don’t feel particularly attracted to water birth (though I wasn’t really attracted before I ever had any kids either, so it isn’t all related to those past bath experiences). Can I be strong and powerful in the water, or is that just where I bleed and cry? I’ve been planning to try water during this upcoming birth because I’ve never done it before and because it might help prevent the issues with tearing that I’ve had in the past. However, I have had trouble actually picturing myself doing it. As I stilled into this peaceful, non-wounded, ceremonial bath, I could picture a safe, secure water birth better than ever before. Essential oil blend from my mom. Salts from the Mother Blessing salt bowl. Fresh picked rose petals on a blooming belly! And, to finish the assignments for this week’s class, we made and enjoyed Thai sweet tea for dessert after dinner! Yesterday, I finished the last assignments for my Sacred Pregnancy class. While I primarily took this class for personal reasons and am glad I did because I truly think it was the absolute BEST thing I could have done for myself to get ready for Tanner, to spend some time focused on my pregnancy, and to get ready for another mindful birth and postpartum experience. 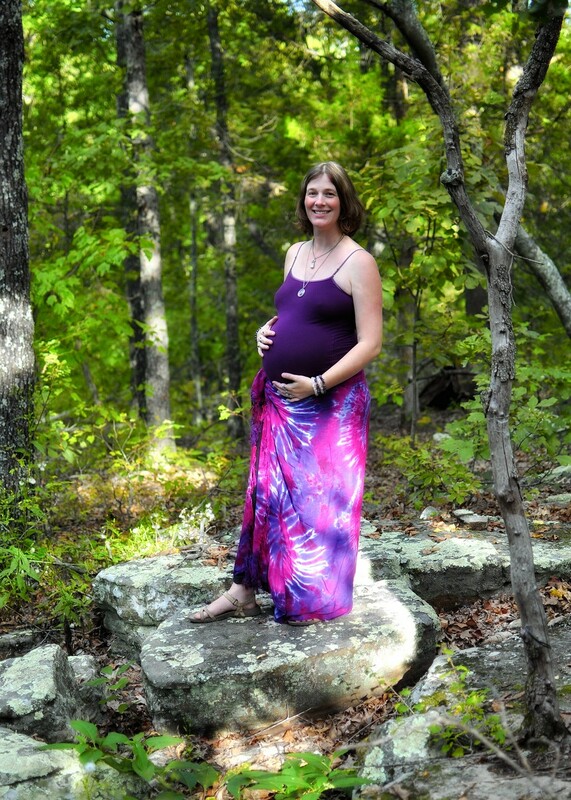 I have also completed all the work needed to be a Certified Sacred Pregnancy Mini-Retreat Instructor. On October 1st, I start the Sacred Postpartum training program—again with a dual purpose of personal enrichment and professional development. 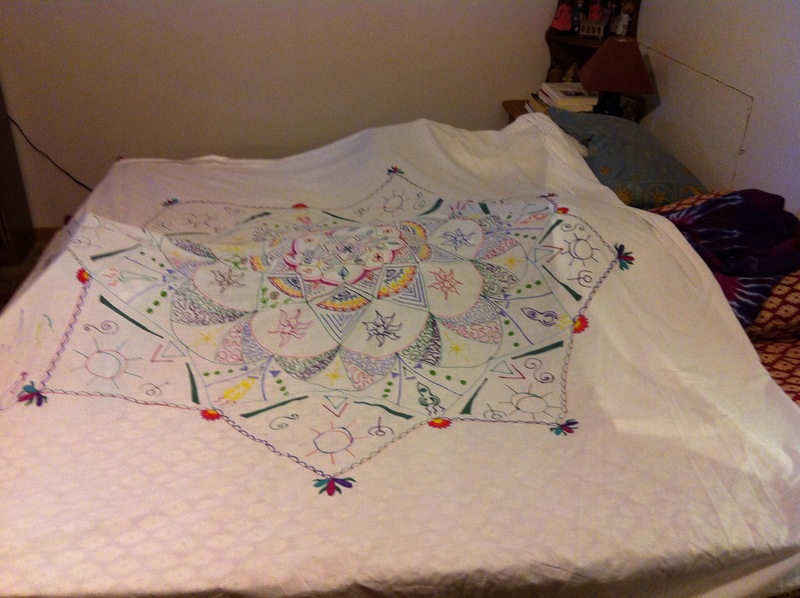 I completed some of the activities out-of-order and finished the silk painting and honoring crown from week 3 in conjunction with the postpartum and “sealing” work of week 4. I chose to use my drumstick as my stick around which to wrap my silk, since the drum is one way I express myself. Bringing the words painted on the silk into my drumming seemed like a logical companion. My silk power was bold fearlessness! Zander and Alaina also worked on small pieces of silk with me. I’d delayed making the flower crown I thought because I’d told myself that I’ve already had several flower crowns at different ceremonies and so making another one for “no reason” felt kind of redundant. However, after I finished my second silk painting, I looked behind me and saw some wildflowers and I realized I did want to make a crown and I wanted to be with real flowers and not artificial. I’d been going to do artificial since I have some and thought then I could at least check it off the list. I don’t like fake flowers though, I like real ones. As soon as I realized that there were enough wildflowers scattered around the yard that I could make a real one, I got excited about the idea. My daughter helped me find and cut the flowers and then we put it together. And, then took some picture with my new silk and the crown together. I love the idea of a post-birth sealing ceremony SO much. 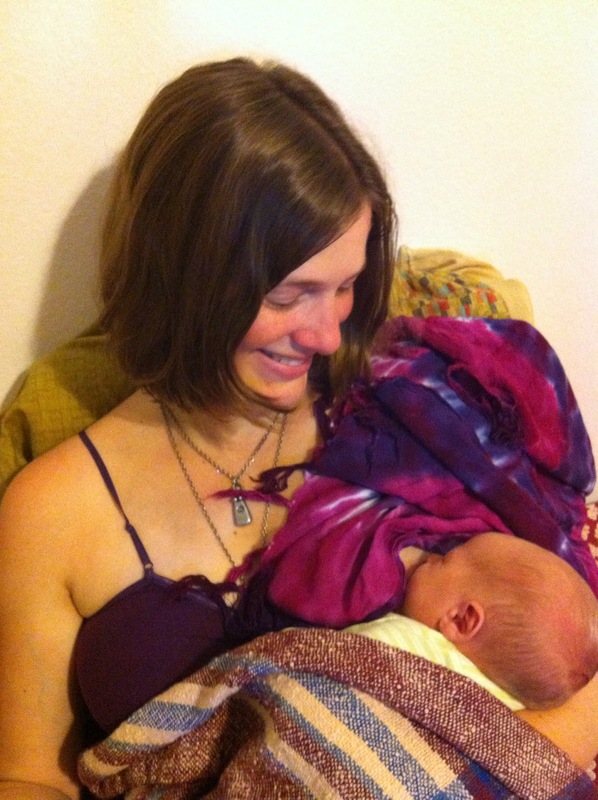 This is similar to a mother blessing, but it is held postpartum to help “seal” the birth experience and welcome the baby and the mother into motherhood (or mother of however-many-children-hood). Absolutely wonderful. I also love the song Standing on the Edge from the Sacred Pregnancy CD. I identify with it so much as I prepare for my next birth as well as to welcome a new baby who I wasn’t expecting to have. As I’ve noted often in recent blog posts, I’m working very hard to wrap up a variety of projects so that I can cocoon with my new baby and give him and me the time and space I know we will need after birth. I have gotten better and better at taking care of myself postpartum, in asking for what I need, and getting very, very clear with my support people about what is most important to me. We actually made the flax pillows for the sealing ceremony at the beginning of the week and then used them on Sunday (Alaina and I made the PPD tincture together the same day as the pillows). 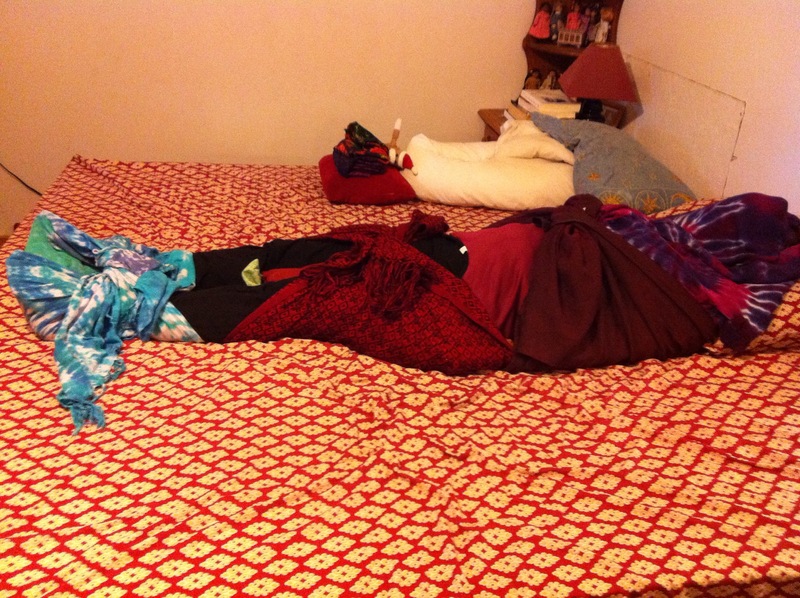 My husband tucked me in with the flax pillows and scarf and draped the silk painting across me as well. I lit my pregnancy candles and listened to Standing at the Edge. I spoke aloud the things I celebrate myself for–all the projects and children I have given birth to. As I was setting up my wrap and pillows, my almost-11-year-old son had said he’d like to do it too. 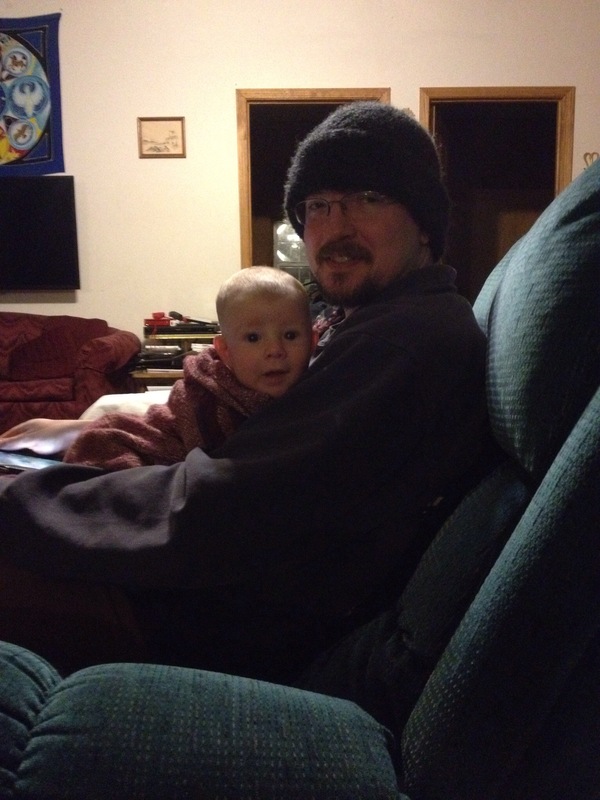 So, after my own sealing experience, each of my kids in turn got sealed in the scarf with the flax pillows. And, then they went and got my husband and we sealed him too! For each, I offered a blessing: “I’m glad you were born. I’m glad you are my son/daughter/husband. I love you. Thank you.” I placed my hands on different parts of their bodies as I spoke and then ended with kiss on the forehead. They all loved it and were very calm and contemplative. I think it was good for all of us and was, in its way, a “sealing” of their births and our relationship. While I always have had a mother blessing ceremony before the baby’s birth, this time I’m going to make sure to do a postpartum sealing ceremony as well. The birth I actually sealed most consciously was the second trimester birth-death of my third son. On my due date with him, which also happened to be my birthday, I did a ceremony outside by our little labyrinth and the tree where we buried him. I spoke aloud, “I am not pregnant anymore,” and took time to hold and honor the powerful, honorable, birth and release I’d given him. I’ve written a lot about my own postpartum thoughts, experiences, and feelings and they are grouped under the appropriate category on my blog here. I also want to share a picture of my new mother-of-four goddess pendant! This pendant, too, has been part of my personal emotional preparation to integrate the new baby into my maternal identity. It took a long time for us to get the cast right for this sculpt and I’m so happy to have it to wear now. 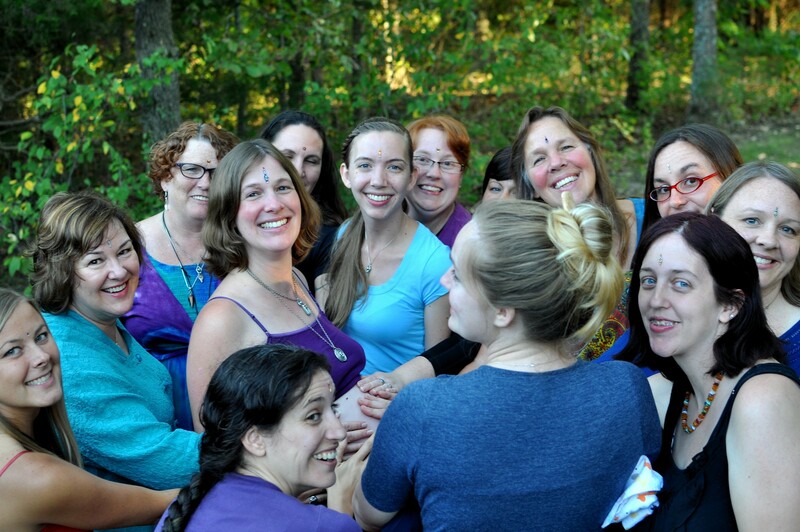 The Sacred Pregnancy online retreat training experience was a very positive one. Lots of personal benefit as well as professional development! I’m so glad I decided to go for it! I told you I had a Sacred Pregnancy weekend! On Saturday of last week, after my fears and forgiveness work, I moved on to some empowerment and self-care exercises. I had been trying to find time to do the silk painting since Wednesday and kept feeling disappointed to not be able to make room for it. On Saturday it became Priority 1! I decided to modify the exercise for my whole family to do as a collaborative “welcome” wrap for baby Tanner, rather than tearing it up to wrap onto sticks as we were supposed to do. I’m going to do the tearing and sacred stick making on my own another day using a different piece of silk. We listened to the Sacred Pregnancy CD and all worked together outside on a hot, hot August Saturday. It was a lovely, sacred, shared, collaborative project (with a touch of a chaos and a sprinkle of yelled, “don’t spill it!”). Very fulfilling and much fun. Later in the day I also did my sacred bath and self-care day. My 3-year-old daughter and I made a special salt scrub for me to use using sunflower oil, sea salt, and gentle baby essential oil blend (made by my mom). After the empowerment silk painting (which was part of my self-care too), I set up a special altar in my bathroom, turned on Nina Lee, drew a Mother’s Wisdom card and meditated on it, and then did my salt scrub on my entire body, followed by a refreshing shower. I really took my time with the scrub and thought about how often I rush through or “don’t have time” for lotion or other personal care treatments after showering. I felt nice and “buffed off” afterward! (I tend to very dry skin.) I also had two cups of Caramel Bedtime Yogi tea that I’d made in a jar in the sun that morning. I “run out of time” for iced tea often too. So, this time I didn’t! These next photos aren’t related to the class work, but they are very related to my own Sacred Pregnancy creative process! In addition to the Womanrunes book, we‘ve been working overtime lately to develop an improved production process for my birth goddess sculptures so that we can actually have them available on a regular basis. While still not perfect, we’ve gotten much closer during the last week and hope have four different designs ready to list in our Etsy shop over the next two weeks.